Install Racetime is very simple. From the home page of the app on play.google.com simply click on install (it costs only € 2.39) and the app will be installed on your smartphone. At your disposal all the updates and tracks. To download the circuits on your Racetime you must go to the “Circuits” section and click on “update” in the row corresponding to the geographical area of the tracks you want to download. Once the tracks have been downloaded you can return at any time in this area and update your circuits. In this way Racetime will always be updated with new circuits and any changes to the tracks. All this without losing the run saved on them. When the download is complete you will see in this section the complete list of all circuits downloaded and each distance from your location. Clicking on single circuit you can view in detail the route and location of finish line and intermediates. The same screen will also feature a direct link to the times section (if you have laps on the circuit) and a button to “manually” select the circuit for GPS stopwatch (only if GPS service is active). 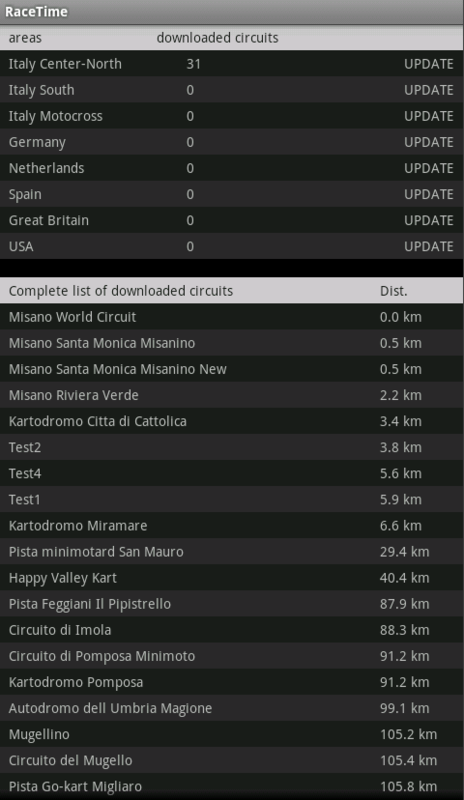 If your Track is not in the list contact us, we will soon add it to the available circuits. This is the initial screen of Racetime. In the lower part there is the control panel, from which you can monitor the main components. Accuracy of the GPS signal: indicates the precision in detecting the position, depends on the signal strength, the quality of the GPS receiver, the weather situation and the position of the device. OPTIONS button to edit recording options: audio, lean angle, g force, Rapid Bike data, LIVE Timing. Under the control panel there are the close button and the rotation button. Automatic rotation has been disabled because it could intervene even when it is not necessary during the lap because of the movements and vibrations of the vehicle. When you are near a Racetime circuit, the app will automatically detect it and then you can click on CHRONO button and select the circuit . In addition to using the stopwatch, from this area you’ll have access to the Speedometer (SPEED), TRACKER and RAPID BIKE. Also is this screen thiere is the control panel, to always know your app’s status. Recording run is very simple. To start recording, simply click on START. From this moment all the laps will be recorded, and all the splits and the maximum speed will be saved and then be consulted later. It’s important to remember, once your run ends, clicking the STOP button in order to finalize the recording and close this way the session. A session can ideally have an infinite life, there are no limits to the number of laps and time. Clicking on the “time” button you can see the times of the recorded runs according to the circuit. For each run, you can view all the laps with the corresponding intermediates and the ideal lap. Highlights indication of the difference from the previous lap and from the best lap times, and the maximum speed. If the Run that you are viewing has been registered with Racetime PRO, from this screen you can upload it to your account through the button at the top. Recording PRO runs you can analize every you will be able to analize deeply every lap, with data graphs, point per point detections and trajectory analisis. Using Racetime PRO is very simple, first of all you must be registered, and to do that you need to go into “Racetime PRO” area of your app through the appropriate button (number 8). From here, simply by entering your name, your email and a password, you can register your account to Racetime PRO with a single touch. After registration you will receive an automatic email for verification of the data and account activation. It’s very important to get that email and click the link received in order to have an account up and running. If you already have an account, from the same screen you can also log in. From the same area , if you have already logged in, you can change your data at any time ( email change leads to a further activation). Once logged in, all Racetime PRO options will be enabled. The run recorded with this enabled option will be uploaded to your account in order to be analyzed. This type of registration requires obviously more resources from your device. In times view is present the “Upload on Racetime PRO” button. With this button, you can upload your run to your Racetime PRO account. All the runs uploaded to your account will be available in your reserved area. After you have logged in, with your email and password, Racetime PRO offers the possibility to analyze all loaded runs. These data will be consulted at any time from any computer or tablet. Since version 3.0 Racetime add the “Tracker”. To activate it, simply click on TRACKER in the home screen. From the screen of the tracker you can see the speed in real time, clicking on START button you will activate the tracker from the point where you are. From here, Racetime will keep track of your tour and will report on the screen the mileage and time spent. To stop the Tracker simply click on STOP and save the tour. In the TOURS section you can consult your tours at any time and you can upload them to your Racetime PRO account. Racetime PRO will show your tour with more details, with the speed graph and the trajectory of the trip on the map. From the home screen, in addition to select the track on where you are located, you can access the acceleration measurement, simply by clicking the “SPEEDOMETER”. In this screen, you can view the speed graph, real time speed, acceleration time from 0 to 100Km/h and distance traveled. To reset all values use RESET button.